Talented and blustery Peter Burnett deserves historical resurrection, particularly for Oregon and California readers. In Oregon in the 1840s, Burnett proved an ambitious, go-ahead leader in political and judicial pursuits. Later in California he rose to the top, named the state’s first governor in 1850. Thereafter Burnett took on roles as a banker, developer and writer. But over the years Burnett’s important contributions have been lost. R. Gregory Nokes restores Burnett to the front pages of West Coast history in the smoothly written biography “The Troubled Life of Peter Burnett: Oregon Pioneer and First Governor of California” (Oregon State University Press, 288 pages, $19.95). Nokes exhibits once again his first-rate talents as journalist and historian. He fashions a superb story about a notable pioneer leader, repeating sterling performances in “Massacred for Gold: The Chinese in Hells Canyon” (2009) and “Breaking Chains: Slavery on Trial in the Oregon Territory” (2013). Burnett’s “troubled” personality surfaced in his first years and reappeared on his trip up the Oregon Trail in 1843. Burnett was named wagon train captain of nearly 1,000 overlanders, but after a week of inflexible, unpopular decisions and actions, he resigned rather than listening to his fellow emigrants and changing his attitudes. It was an erratic, disruptive pattern that characterized his life time and again. In Oregon, Burnett, with a wife and six children to support, tried farming and then attempted, unsuccessfully, to found Linntown along the Willamette River north of Portland. After only nine months in Oregon, he was named to the territory’s legislative committee. The assertive Burnett early on exhibited anti-black attitudes by sponsoring an odious “Lash Law,” which included a beating for blacks who refused to leave the territory. Burnett continued to gain offices in Oregon. In 1845, he was named supreme judge of the Territorial Supreme Court, but resigned to enter private law practice. In 1848, he was elected to the new territorial legislature, but resigned after two months and left for California, where he hoped to get rich in the Gold Rush. 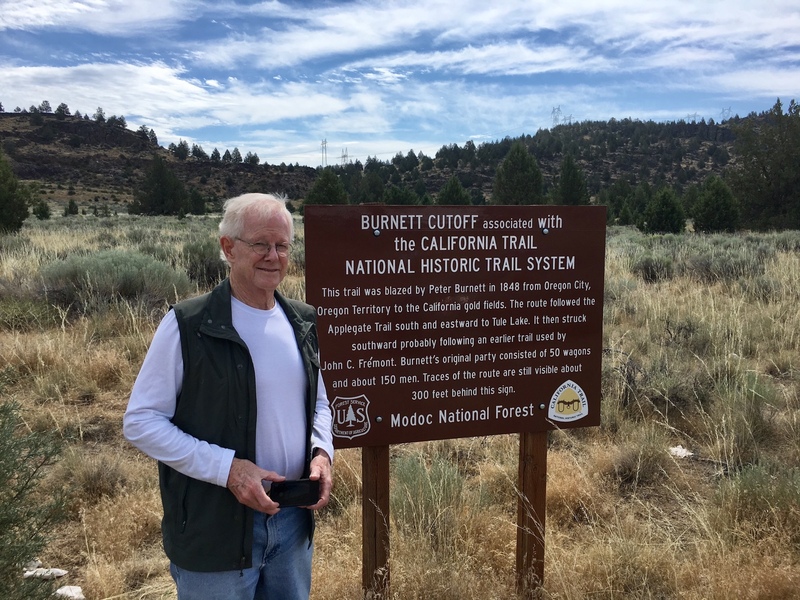 Author R. Gregory Nokes at the Burnett Cutoff trail used by westward emigrants and named for the subject of Nokes’ new biography, Peter Burnett. Burnett’s ability to capture attention and high position reasserted itself on his way to California. Chosen a trail leader in 1848, he led 150 travelers with 46 wagons and ox teams south and established the Burnett Cutoff from Oregon to California. Quickly, Burnett was involved with land developer John Sutter and eventual millionaire Mormon Sam Brannan. In November 1849, roughly one year after his arrival, he was easily elected the first governor of the state of California, although Congress did not recognize the state until September 1850. Again, Burnett had overnight captured attention and votes. And, again, amidst criticism, disagreement and increasing unpopularity, he resigned in January 1851. Nokes devotes several chapters to Burnett’s rise, his continued support for anti-black legislation, his ins and outs as a land investor, banker, his Catholic faith and his writings. Burnett died in San Francisco, in May 1895, after nearly a half century in northern California. Nokes furnishes lay and specialist readers with an extraordinarily readable and dependable biography. Particularly valuable are the author’s assessments of Burnett’s mercurial personality, his ups and downs as a leader and his now-odious racial attitudes. Present in these pages are both narrative power and apt analyses and evaluations, a combination too often missing in purely academic books. One quibble. Most western historians are likely to disagree with Nokes’ assertion that Burnett’s “resume is the most impressive of any leader in the early American West” when they keep in mind the achievements of such men as Brigham Young, Stephen F. Austin and John C. Fremont. In fact, Joseph Lane, Matthew Deady and several others were more important than Burnett in shaping Oregon. In addition, in other chapters, Burnett is often lost in contextual backgrounds. Nokes’ largest achievement is his storytelling power. Undoubtedly his appealing narrative style was honed during his years writing for The Oregonian and The Associated Press. Here is the revealing, exceptionally readable biography we have needed to bring Peter Burnett deservedly back on the scene. Also: Nokes also appears from 10 a.m. to 1:30 p.m. Saturday, June 2, at the Wilsonville Festival of Arts, Town Center Park, 29600 S.W. Park Place, Wilsonville.